Well, last week was perhaps the most unlucky week of my life, to this point. As it happens, I seem to have remained in relatively high spirits, and there is much to celebrate in spite of the misfortune. The week started with my tools getting stolen from my house. I was helping put on a fundraiser event for Student Action with Farmworkers out at the farm. My brother (with whom I live) was out of town, and Spencer (dog) was with me. So no cars, no dogs, and no people at home. Perfect opportunity. The jacklegs made off with my saws and drills, sanders, etc. Pretty much all of my power tools. But they didn’t take my bikes, nor did they enter the house. The neighbors called the cops, but the description (black male, 6 feet tall, age 25-35, dressed in jeans and a t-shirt) would have fit about 75% of my neighborhood. The following day I was clearing some saplings at my dad’s house when my hatchet wound up in my shin… I got caught on some briers and my swing was shortened enough to land in my leg. I made it up to the house before getting woozy. I didn’t do any major damage, but blood was spewing in an awesome way. I spent a few hours in the hospital getting stitched up, but all is well. After about a week I’m walking well, and resisting the urge to take the stitches out. As some of you have probably already guessed, I have developed quite a passion for mushrooms. 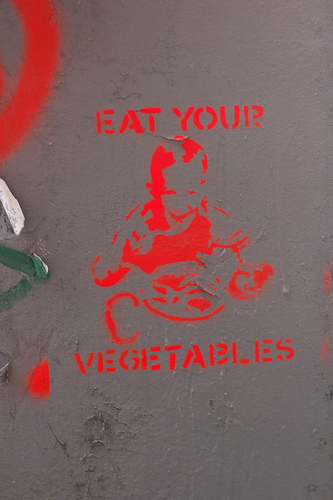 Cultivating, foraging, and of course eating them. After going to a series of mushroom-related workshops at the CFSA conference last year, all of which were given by Tradd Cotter of Mushroom Mountain, I felt inspired to try my hand at cultivating these mysterious organisms. Mushrooms, I learned, exist at the interface between the living and the dead. Mushrooms and mycelium break down dead and dying organic matter and turn it into fertile soil, ready to support new life. They are nature’s recyclers, and are also capable of sequestering hard metals and disarming toxins. Fungi are an essential part of the ecology of our planet, so I felt compelled to get to know them, and learn how to harness their amazing potential for the benefit of our gardens. Weird……I know. I watched them closely, checking their progress daily, and making sure no mold attempted to take over. After a while I was getting impatient. Everything I read said that they should have fruited 2-3weeks after I inoculated them, and by this time it had been over two months. All that happened over the course of 5 days. They were the first thing I looked at when I got up and the last thing I looked at before I went to bed. They were growing by the hour. As you can see their blue tint did not last, and I am not sure why. Also, two days of growth are missing from the slideshow, because I heard that morels (the most prized of all wild mushrooms) were in season. Did I mention that I’ve got mushroom fever? I woke up Saturday dreaming of mushrooms, so I ditched all my plans of doing taxes and cleaning house, and spent the entire weekend foraging. I was well rewarded. While foraging, I was so focused on finding morels that I lost my dog’s leash, my hat, and my way around. While wandering through the woods trying to figure out where I was but mostly looking for mushrooms, my dog found her leash, and then I recognized where I was again. My hat belongs to the forest now. My husband came along for the hunt on Sunday, and I could see the glint of mushroom fervor in his eyes. That glint grew to a radiant sparkle when we had our supper of morel and pancetta pizza. Morels are one of the easiest mushrooms to identify for beginners, and the tastiest, but there are harmful look-alikes. If you are interested in foraging I can’t stress enough the need to educate yourself on harmful varieties, and go with an expert for the first few forays. Mushrooms are truly incredible organisms once you get to know them. I look forward to many delicious years of learning. We had a wonderful time on Saturday enjoying the bright change in weather, meeting new friends, and inoculating this season’s shiitake mushroom logs. We all made some new connections, and I am proud to say that twelve more people in our community can now grow their own shiitakes. Empowering and educating others to be able to do for themselves tomorrow what they could not do yesterday is one of the foundational goals of New Grass Gardens, and one of the best ways that we feel we can support the community that supports us. We are planning a series of monthly workshops, so check back for more details soon. Thanks to everyone who came out yesterday, we couldn’t have done it without you! Hey folks. Market season is upon us. NGG won’t be at a Saturday Farmer’s Markets this year. Rather than getting up at 4 AM every Saturday to watch our produce melt in the heat, we’ve partnered with NOFO to create a permanent indoor market for sustainable food producers in the area. We’ll be open 7 days a week, selling our own produce, as well as produce sourced from select local, sustainable growers. Check out the blog for details. We’ll need your help to maintain this outlet for farmers – a critical step towards a sustainable food system in Raleigh. Additionally, we have a few spots left for the Mushroom Workshop this Saturday. Farm Basket numbers are still low. I’m somewhat relieved after talking to a bunch of local farmers who’ve experienced similar responses to their CSA programs. We still have spaces, and we’ve labored to create maximum convenience, customization, and affordability. Consider signing up! And, if not, let us know what we can do to make our program more attractive to you. We are very pleased to announce that we will be opening a produce market within NOFO at the Pig at Five-points! We are always searching for new ways to bring the freshest, sustainably and locally grown produce into the urban Raleigh communities that support us. This is our vision of an urban farm stand, with the latest harvest right at your fingertips. The Market at NOFO will be the only place in Raleigh that you can buy produce grown in Raleigh! You can’t get more local than this. Beginning Friday April first, you will be able to purchase produce grown by New Grass Gardens as well as a select few additional local organic farmers 7 days a week. The market will be open Monday- Saturday 10am -6pm and Sunday 10am-3pm. We will also be offering a selection of our favorite seeds as well as potted plants for your own kitchen garden. Workshops at NOFO hosted by NGG are in the works, as well as Saturday meet and greets with the NGG farmers. Don’t forget about our Farm Basket program, through which you could save 10% on all your purchases from the Market at NOFO. Click here for more details. 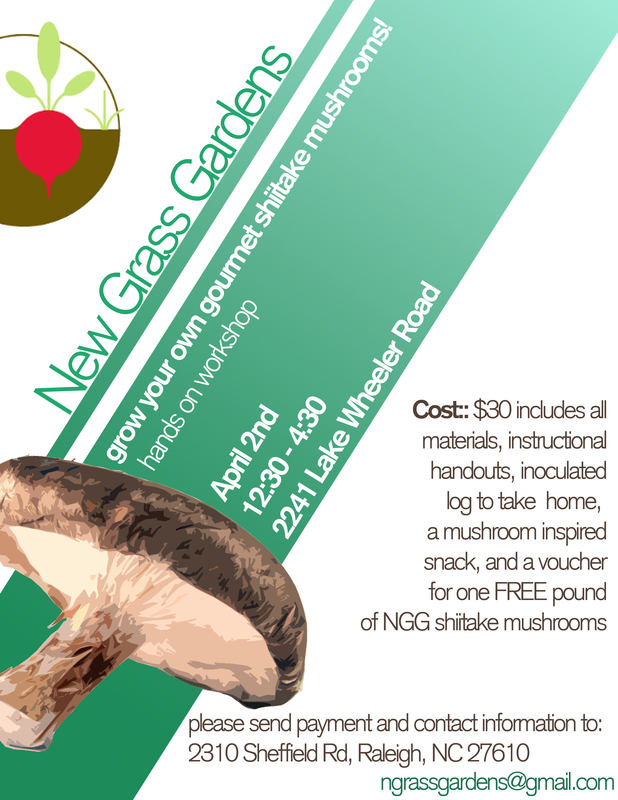 And remember to sign up soon for the Shiitake growing workshop this coming Saturday April 2nd! More info here.